Shippers often work under the assumption that the way they ship freight (and the associated costs) are pretty much fixed and can’t change. But just because “it’s always been done this way” doesn’t mean you shouldn’t challenge the status quo. At Kane Is Able, we’ve identified a ton of ways to reduce freight costs, with changes you can begin implementing today. Some of them are very simple – such as offering night-time freight pick-ups. A smart approach opens the door to savings that can reach as high as 50% of “business as usual” freight charges. 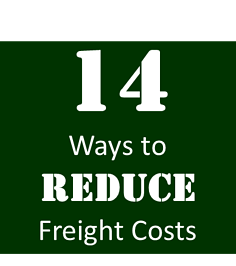 Below are 14 specific suggestions to cut those freight costs, including an estimate of how much you could save. Contract steady lane volume. If your carrier knows he is going to work with you every day, and is going to get a regular flow of freight in the same lane, he can market those backhauls and build out his network. As a result, you’ll pay less because the carrier is more efficient. Furthermore, with capacity as tight as it is these days, these carriers will focus on moving the freight of the people who are loyal and have reliable freight volumes. POTENTIAL SAVINGS: 2-12% versus traditional lane pricing. Ship on off-peak days. Shipping a day later or earlier can yield measurable savings. Friday is typically an off-peak day for shipping consumer goods because most customers try to get their product to store by Thursday, so it can be shelved Friday and ready for sale at the weekend. Mondays also tend to be low-volume days when carriers are typically looking for freight. Obviously, it depends on the cargo – canned goods, for example, have more of a window than fresh goods. Shipping off-peak is certainly a great option for shippers of non-consumer type products. Find a consolidation program near you to handle smaller shipments. Retail consolidation is a no-brainer – you combine your LTL shipments with other nearby companies shipping to the same mass retailers and grocery chains for direct delivery, and everyone wins. Even larger shippers like Colgate and CVS have gotten into the game. Suppliers like you pay only for your share of a less-expensive TL shipment. And retailers receive loads on time and get the same volume of goods in fewer, fuller loads to keep their dock bays open and cut labor costs. Where can you find suitable shipper-partners? Local Chambers of Commerce or other business organizations are one place. You can also work with a 3PL with a freight consolidation program that serves multiple companies shipping to the same retail customers. POTENTIAL SAVINGS: up to 25% versus the cost of unconsolidated loads. Don’t be a serial rate shopper; develop relationships. You may feel obliged to do the yearly RFP dance in order to show management you’re serious about reducing freight costs, but severing the relationship and starting fresh with new carriers every year is not the best approach. It's really the freight equivalent of "speed dating." When shippers develop more strategic, longer-term carrier relationships, they create transportation management advantages that have bottom line implications. Longer term contracts give the carrier time to mine for other customers in the area to create a more efficient network with minimal deadhead miles. A carrier that is maximizing assets is more profitable and can afford to give you better rates. A longer-term contract, say 3 years, also locks in that rate for the contract period, instead of changing – and maybe going up – every year. Oh, and you get better service, too, from a carrier you’ve committed to long-term. Hard to put a price on that, but it’s significant. POTENTIAL SAVINGS: 3-5% per year, these savings estimates can easily double when capacity tightens. Increase delivery lead times. Any time you can introduce planning into the supply chain, and maximize the advance notice to the carrier about future loads, they are able to maximize assets, including trucks, drivers and warehousing space. An advance shipping notice allows a carrier to line up the assets and resources, plain and simple. One of the biggest costs for carriers is paying for a trailer to sit idle at someone’s facility, waiting to load up. Having better planning allows carriers to reduce those costs, then pass some of them on to you. Planning can be improved on all aspects of the supply chain – pick up, staging, live-loading. The longer the notice, the more carriers can do behind the scenes to be more efficient and come to you with a better price. Reduce dunnage. A lot of products require air bags, strapping, blocking and bracing to prevent them knocking together during a trip across the ocean or on a long-distance truck ride. But sometimes shippers go overboard in trying to protect a product. Carriers can help you skinny down on that dunnage and reduce shipping costs – without increasing damage. Don’t be afraid to seek their advice. Dimensional weight pricing strategies from carriers rewards shippers for shipping in just the right sized box, which cuts box weight and dunnage. POTENTIAL SAVINGS: 1-3% on a per load basis. Develop a reputation for loading quickly. When carriers develop pricing, they typically assume a 2-hour load window. But if the carrier knows they’re picking up at a place where cargo will get loaded in an hour, that affects the price. It also inclines the carrier to work with that shipper. Shippers with consistent load time performance can even get these favorable load times baked into the rate. This avoids the need to chase down assessorial charges – a huge time drain. A shipper that operates efficiently saves money and has carriers lining up to serve them – a two-fold benefit! POTENTIAL SAVINGS: Depends on your current reputation. You can safely figure a carrier has at least $25 an hour factored into their rates for each hour it typically takes you to live load them. Offer night pick-ups. This may give carriers an opportunity to make your load into a backhaul by offering them pick-up times after most other shippers have closed the dock – 6-12 p.m. For example, a carrier might turn down a load that’s requested for a mid-afternoon pick-up because it conflicts with another run. But a later pick-up allows him to make the delivery and fill his backhaul with your freight. This is yet another way of helping the carrier maximize utilization of assets, especially on longer hauls. POTENTIAL SAVINGS: 15-20% off standard rates. Minimize the number of pallet spaces needed when shipping LTL. Optimizing the cube of a product, stacking the product so you take fewer pallet spots, even boxing it differently, all help make it easier to get more cargo packed onto a pallet and into a trailer. For instance, if you put a small component in a large box, you can’t get that many on a pallet, but if you have them in small boxes, you can load the pallet out and save pallet spaces. Ask your carrier for a recommendation on building more efficient pallets. The recommendation will depend on the type of product being shipped. POTENTIAL SAVINGS: up to $150 per pallet space. Ship more product, less often. Encourage customers to take larger orders. It’s a lot cheaper to ship six pallets at once than to send two pallets every two days. But retailers tend to look for smaller shipments more often, so you need to create incentives to take more inventory than they think they need. One way is to agree to share freight savings with the retailer. Another is to consider Vendor Managed Inventory, where the retailer is not charged for the item until it’s on the shelf. POTENTIAL SAVINGS: up to 50% versus the smallest LTL loads, when minimum charges may kick in. Use a load board. If you have a one-off shipment and you throw it on a load board, then you’ll probably catch a low rate, especially if the carrier can handle it as a backhaul. Many smaller shippers, who are in the manufacturing business and not in the freight business, don’t have freight logistics people on staff, so they are unfamiliar with load boards. Carriers love backhauls because they’re making money when they would otherwise incur costs for empty miles. For a backhaul, many are willing to offer a rate that simply covers fuel costs, plus a little bit extra. Look for carriers based near your ship-to points. That way your load is more likely to become a backhaul for them and you’ll get a lower rate. Filling empty miles is the way carriers make better money, and a great way for you to reduce freight costs. It’s surprising how many shippers don’t investigate carrier terminals near their frequent ship-to locations. POTENTIAL SAVINGS: 20% versus a non-backhaul rate for that lane. Get logistics involved earlier in decisions about product design, packaging, and carton selection. These are all things that impact the ability to max out the cube of your trailers. What many companies don’t realize is that packaging is the smallest cost segment in the supply chain, comprising less than 10% of each supply chain dollar. In contrast, warehousing is about 25% of the cost and transportation 60% of the cost. So it makes sense to design packaging and to spec carton sizes with freight efficiency in mind. The marketers currently making these decisions won’t have this mindset. Most companies just don’t think about packaging optimization and the impact on freight rates. POTENTIAL SAVINGS: 10% when comparing the total cost of packaging, warehousing and transportation. Outsource your transportation department. For smaller companies especially, freight management is not a core competency. Hiring, training and maintaining a transportation staff, and keeping up with systems requirements, can be expensive and time-consuming. Add to that hiring, managing and retaining a driver force. Outsourcing freight management transfers the financial burden of staffing and capital expenditures and also opens the door to innovative solutions that on-the-ball carriers should be suggesting. Also, carriers will simply operate more efficiently than you because they can buy things, like fuel, in bulk. If you own your own trucks, consider parking them and investigate outsourcing freight to outside experts. POTENTIAL SAVINGS: 3 to 5%. Shippers who own their own fleet of trucks are often paying at least a 25% premium over the typical cost of outsourcing delivery needs to reputable and reliable carriers. Many of these solutions seem self-evident, and yet shippers often ignore them, and end up paying more for freight than they should. Why? The main culprit is blanket acceptance of “business as usual” rules and processes – between internal departments, and between the shipper and the customer. See if any of the above suggestions make sense for your business. Then go a step further. Examine your freight program and question every built-in assumption – it has to get there in two days, rail would never work, marketing determines the carton size. Challenge the status quo, and watch the savings, and the appreciation, roll in.